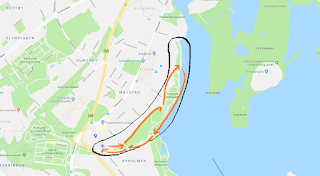 This morning I've been "out in the wild" (a recreation area close to our school) with some colleagues to experience what an awesome education tool seppo.io could be. No matter how good the educational thought is with seppo, my colleagues still needed a real case to experience before they could truly understand the power of seppo! They also needed to act as students in order to understand the game mechanics and the different possibilities (or obstacles students run into). As schools and educator's are so afraid of step out of their comfortable zone, it's very hard to try something new. They are often so locked in their mindset, even if they are allowed to use the device to both play as google, it's too much information and too much out of their comfortable zone. Research has proven that walking at least 30 minutes a day, with an activity level that is higher than an average stroll, has an effect on the general condition and general well-being. Also, the activity should preferably be performed in continuous periods of at least ten minutes. The activity should be so intense that you get easily breathed and get a bit difficult to talk at the same time. I have my students out walking for at least 30 minutes, and every 10 minutes they will have a short break. During that short break I want them to answer some questions with seppo. 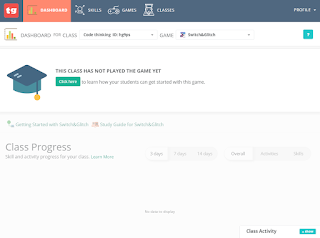 First my players (the teachers) had challenges to log in to the platform. 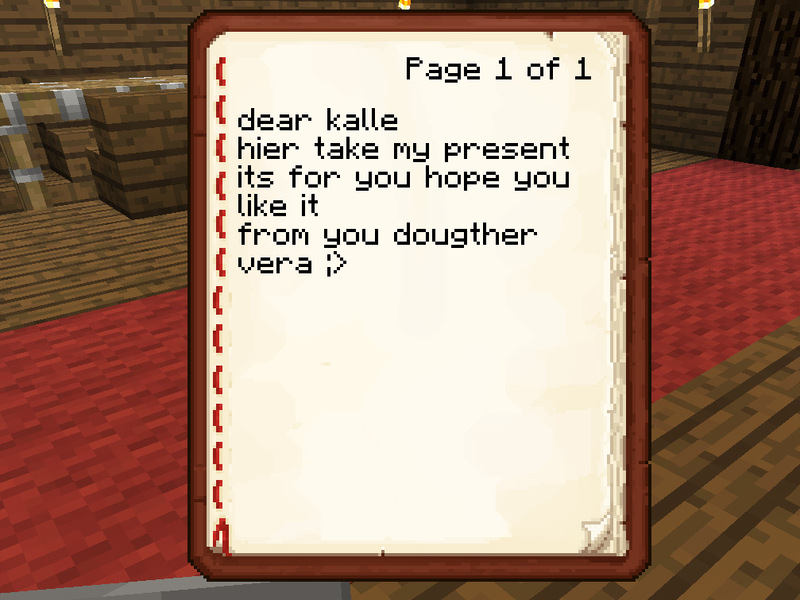 Of course they hadn't read through the walkthru I made for them. The sports teachers were the ones who was most suspicious about seppo but eager to go out exercise. Next challenge, chrome and Samsung seem to be a lottery. Suddenly chrome stop answer, the teachers didn't know how to access the settings (of the work phone) and were almost about to give up. The problem occurred when we tried to reach the camera to do selfies. All controls had different examples of seppo solutions to answer a question; text, movie, audio, photo, check boxes, missing words. After each question we went through each question by edit it, and they slowly started to realize it's their own imagination that sets the limits. The board we used had the wrong layout, it should be more of a circle, else the students take the nearby controls first and in wrong order. They will get exercise in order to answer all questions but the educational idea of have them walk for 10 min, take a pause and answer a task then repeat fails. Same experienced as when I tested with my daughter and her friends. It very soon turn into a competition, even if you discuss and collaborate you want to put in individual answers. And if you were skeptical at first to really do the faster walking it only takes a control before you actually walk a bit faster. The more controls, the more variations of how to answer a question the more they started to see the possibilities of using seppo and how to design the question (change the traditional questions) so they fit the audio/photo/movie option. To chat was too hard, they couldn't multitask even though the girls was in majority. To be able to light up a question first when you're on a certain distance was surprisingly positive, as they many times thought they were in the right spot but now have to understand you can't cheat. Even though we had challenges, the overall experience of this was very positive. Our sports teachers changed their opinions 180 degrees and understood the limits are their minds, and all that they now need is creativity and think differently. For the last three years I've been working with esport in education and how to implement esport courses into an existing vocational program. 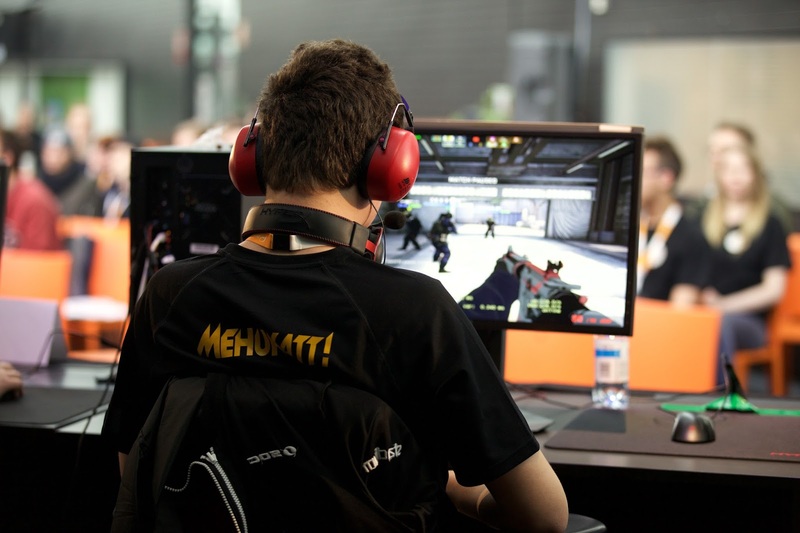 Therefore, from this very beginning, you should be aware of there's (at least) two different ways and mindsets when you bring esport to school and education. As Finland for about 750 years (!) belonged to Sweden, Finland still compete with Sweden and of course, everything that happens in Sweden sooner and later comes to Finland. Therefore, Finnish media nor the federation, could believe the fact we were at the same page with Sweden in the Fall of 2015. I'm working as a remedial teacher at Yrkesinstitutet Prakticum, which is the only upper secondary vocational institution in the Greater Helsinki area where the language of instruction is Swedish and that offers initial vocational education for young people and adults. 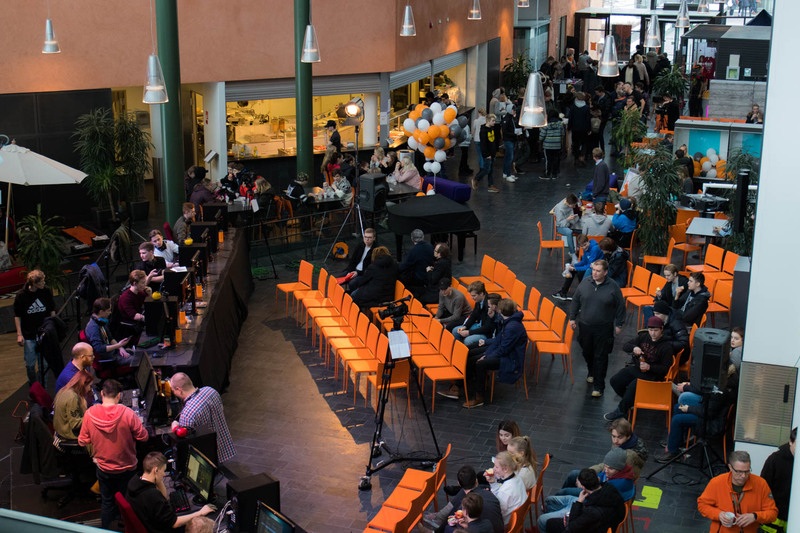 Anyhow, the news of the (school) year 2015 was that you could study esport, just as any other sport, at Arlandagymnasiet in Sweden. No matter if you were a football- handball- or icehockey-player, now you could start learn to be an esport pro at this sports college. Later we understood they got 7 students this first year and in the Spring they had 4 left, they have later been struggling with the in gaming motivation. Also, one important thing to notice. First you have to have good grades, then an esport talent. That Fall - 2015 - we had another situation: We had the third year's student who misunderstood the meaning of freely elective courses. It was never free-if-you-wanted-courses but courses-you-have-to-choose-freely. I started to wonder, do they have any knowledge or interest that we can make into knowledge and study points? What the heck is esports? There my esport in education journey started. I soon teamed up with the school's (traditional) sports coordinator (also national handball coach for youth players) as I soon come to realize students need physical exercise in order to be able to stay focus and handle stress in game. That esport journey is well documented. How were our thoughts when we applied esport into the curriculum? 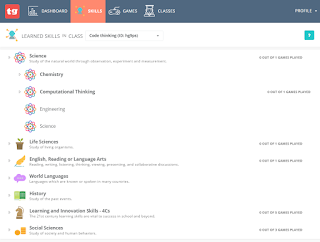 What skills did the industry wanted us to teach? How would the course content look like? We also make a contract with each player! 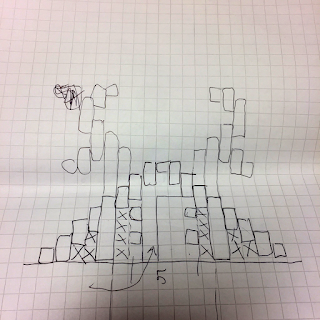 The course content was the worst part to make a sketch of as we had no idea. What we roughly sketched up in the Spring of 2016 and what we planned to do the schoolyear 2016-17 sure helped but what the Finnish esports federation (SEUL) really wanted was course contents like this (including scope, objective, content, method and assessment). As the Finnish vocational curriculum changed 1.1.2018 we also had to change our course. Or actually and more exactly, we - despite Sweden - have a possibility to make an exam part of a vocational education local. Therefore we can offer 20 credits out of 180 about esports. The difference between Sweden and Finland is quite simple. 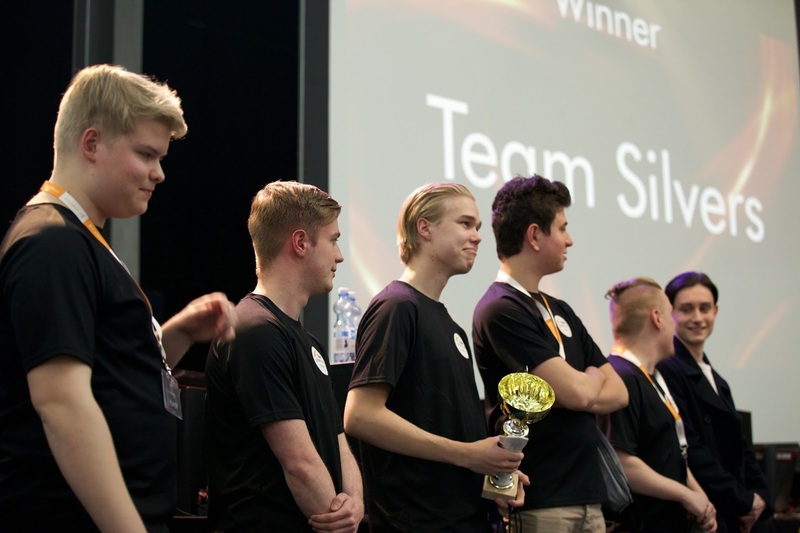 Sweden have former esports professional coaching students inside mainly two games: CSGO and LOL. 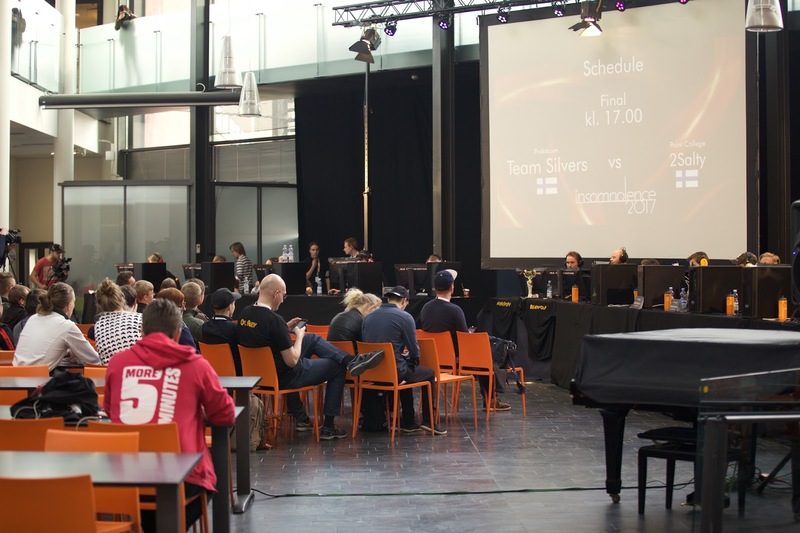 Finland have teachers, experts in different subjects, teaching life skills needed in esports. Even though we now will start to be online ingame, it's not to coach the students in their game - in fact, the choice of game is not important! - but focusing on the personal development of the player. Of course, individual training must be both goal-oriented and significantly more than 5 credits in time, but we think it is realistic to demand 5 credits from the school or the educator to promote the players of tomorrow. 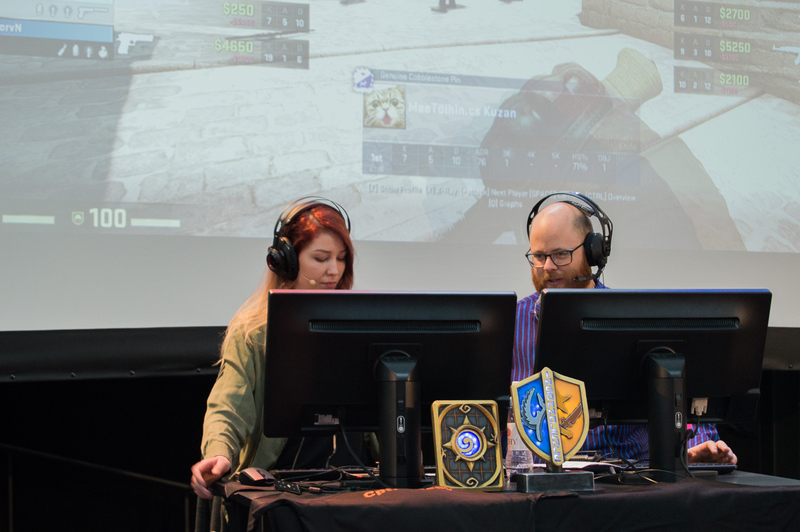 This esport journey finally ended up in the Educator's handbook to esports, which you can find here. Please be aware that as any instruction manual, all three languages (Swedish, English and Finnish) is in the same book! As I assume you want to read the English version of the handbook, scroll down to page 37 something and you'll have the English version. In the same way as it's a handbook, it's also a textbook to students who wants to learn languages! Finally, esports as a learning environment. 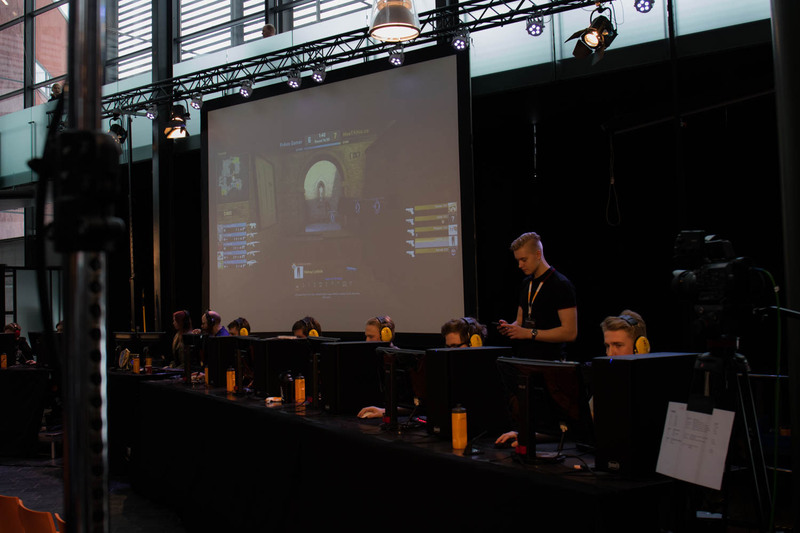 Each year we - Yrkesinstitutet Prakticum - host a CSGO tournament: Insomnolence. It's an esport event arranged by students who, of course, get supervision of teachers. 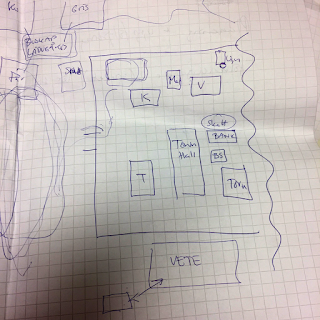 We have "business clerks" make the event, "hotel receptionists" that welcome the guests, "business information technican" who handle the twitch and matches, "ICT assemblers" doing the network and power supplies and "media assistants" that makes the production that streams out in the world via national TV! 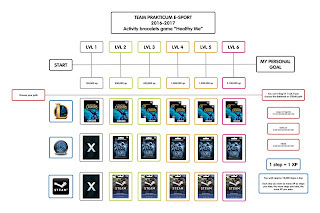 How do you monitoring eSport students physical exercise? We think we've found one way to do this: activity bracelets. 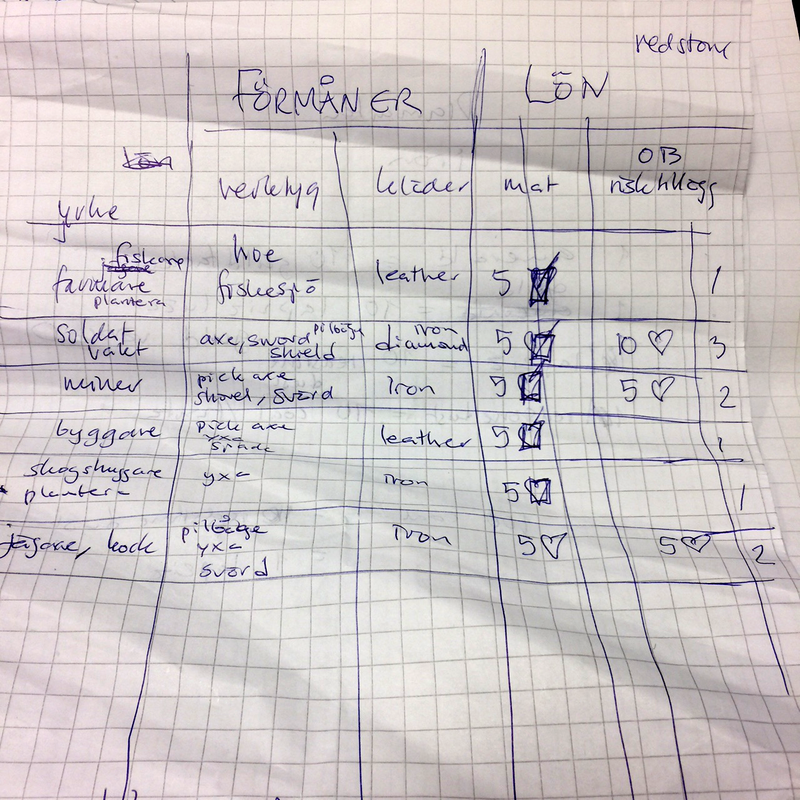 During the schoolyear of 2015-2016 we tried to have our eSport students do training diaries. 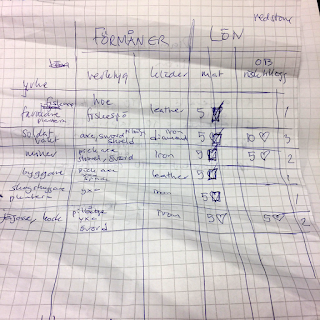 With such a diary we also wanted to have a estimation of how much young people also play competive computergames. As it was hard to have the students understand why its important we changed it last schoolyear (2016-2017) to make a reflection after each in game session. That report would be a tool for us to help them develop their personal skills but also highlight what is not working (be in ti´me, communication, teamwork and more). None of this try out have been working as we want. They (our students) want eSport become a real sport but they don't understand why they have to help us prove it. Not even when we concentrated us on the actual gaming sessions it worked. Suddenly we got funding to use activity bracelets and that money couldn't be used on salary's, instead all should go to motivate the students to exercise! The funding gave us a chance to use gamification on something boring as cardio and walking. We made the walking to a game, each step was one experience point. At a certain amount of steps you achieved next level (ding!) 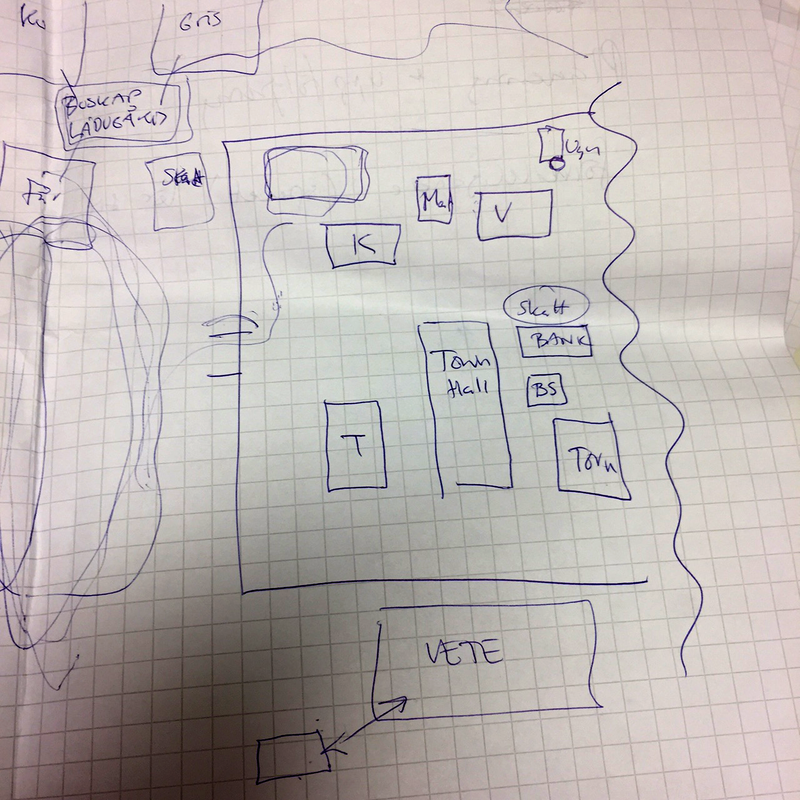 and shortly this is how our gameplan looked like and you can read more about it here. We thought 10.000 steps a day would be reasonable and therefore a month of 30 days would result in 300.000 steps (xp) and a level to reach (lvl 2, and 20€ ingame cash). We had to put a fairly high level as a STEAM card with the value of 20€ (~23,50 USD) is pretty much for a level. Even though 300.000 steps is that much (30 days * 10.000 steps) the amount of steps scared our students. We started in December 2016 and in March 2017 we invented a special occasion: attend the Finnish classic Kalevan Kierros but instead of actual skiing or running, our students had to walk the same distance during one day (between 00:00-24:00) and only one challenge a day. So you couldn't do a 30.000 step challenge and also get all the other lower ones done in the same day. 15 kilometer (km) = 15.000 steps one day, 23 km another day, 54 km a third day. In total we wanted them to walk 218 km = 218.000 steps during one month. This they thought were achievable and they started to walk. Each row is one student, and half of our students have been used it (and reported their steps). We also challenged people from the Finnish eSport scene, like different organizations, researchers and the federation to take the challenge. Of those eight, four accepted the challenge and two made it! So before judging our students, this to start exercise is a challenge for the whole eSport world. Every eSport student will get an activity bracelet as it turns out to be an easy way to monitoring their exercise, their sleep and much more. All they need to do is to wear them and empty their data in a computer. 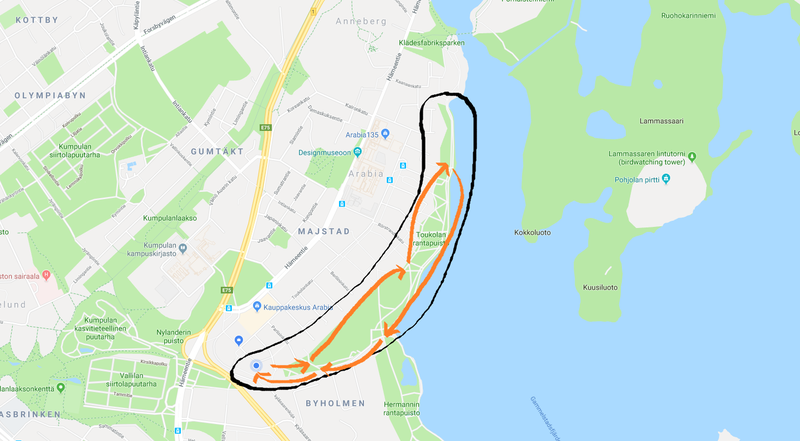 With the last years experience we will set up a required amount of steps you have to walk to pass the course, maybe 5.000 steps a day. And as we don't have funding to such a generous awards this year we'll set up an own higher goal and those students who achieve that will get a reward (like a 20€ STEAM card). I like that walking challenge concept. It teaches young people important routines and it also develops control of life. In a bigger picture - if we watch into the future - today's biggest challenge is 'how to motivate people to exercise'. And I see this case 'Prakticum eSports' is good pilot for that and one big step towards the future. 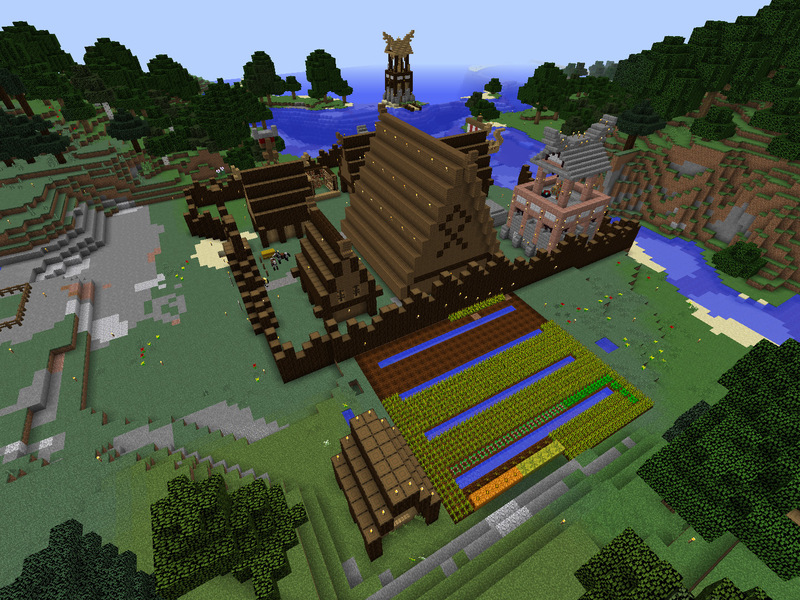 New to use Minecraft in education? During those first 36 hours they had built what you see in the first 1:40 minutes in this clip. What comes to city building you could use this Swedish site Futurecity.nu and it's lessons plans (lektionsplaner) and use Google Translate on it, that would be enough to get inspiration. Student democracy works to a certain limit but you as the teacher have to be the president of your new world. Students can be prime minister, minister of transport, minister of education, Minister of agriculture but you can't leave all responsibility to only students! Your present in the classroom or the virtual classroom have never been as important as now. You need to have them focused on the target and your goals, they need your guidence. 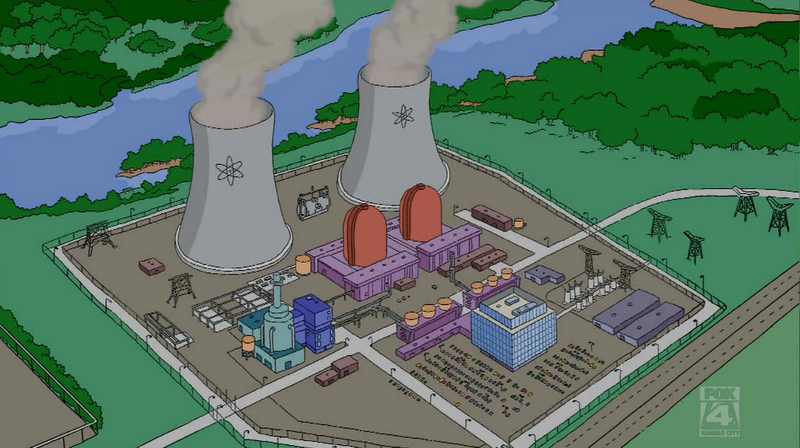 Besides been doing a full scale practice of using a government in Minecraft (without add myself as president) I have also tried to mirror a student group as a company (nuclear power) and I got the same result / experience. The emperor Teacher is vital in game! What went wrong? Well, the whole (task) became too large. They didn't know where to begin and therefor they did anything (else) but what you (as a teacher) had planned or hoped for. I once had a modded server with industrial craft, and as that mod enable you to make nuclear power and nuclear weapons I thought that was a challenge they would be interested to solve. First when I stepped in and gave everyone a task to fulfill they started to come closer to my master plan. 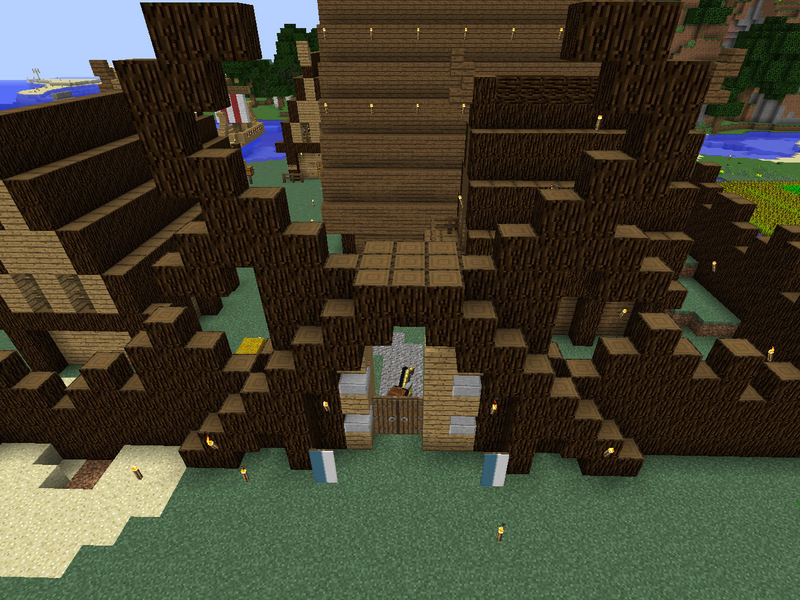 But I had to make them understand they needed to have builders, workers, woodcutters, guards and more. 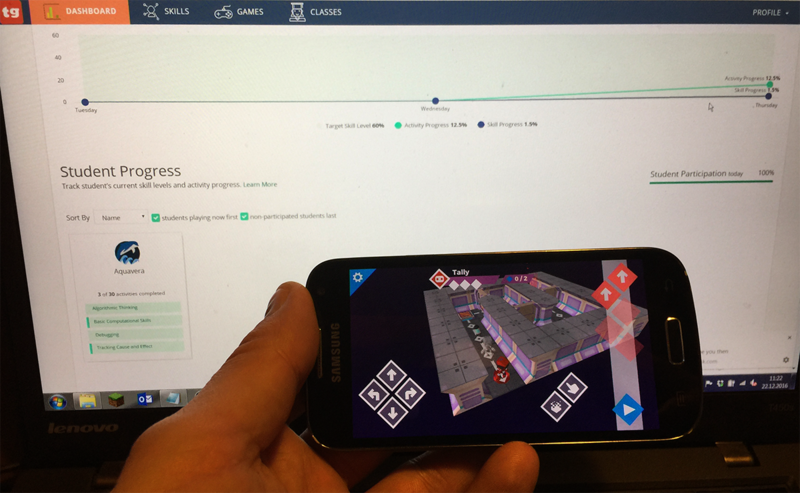 Expecially when you add a game, a chance to work in 3D, students struggle with the big picture. With that said, they have easier to understand coordinates in Minecraft (3 axes; x, y & z) than on paper (2 axes; x & y), an example here. Before they start to build they should have a working gameplan! 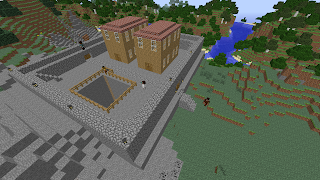 If your biggest challenge is that you're afraid of boring the kids when you start each lesson with "build a model of..." you don't yet have realized the full power of Minecraft. 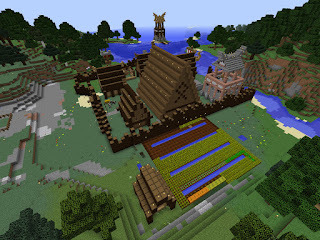 I know SAMR model is severely criticized but when you use Minecraft in education it's a very good tool to use, I've bloged about it here. If you only tell your students to "build a model of..." you havn't changed the task enough to achieve more learning. You're only on level two of the SAMR model: augumentation. You have to change the task, and it's here many teachers start to criticize the SAMR model as you now have to change your course content which, of course, mean more work for you. Deeply sorry, but those teachers are not only lazy but also to blame that students of today loses interest of education. Instead of write the essay on paper, students now write it with Google Docs. Students collaborate in google docs and are also able to comment each other work. Students roleplay the book story inside Minecraft, make a movie of it and upload it to Youtube. You have to come up with a storyline, you have to document the whole process and while do that you can prove you have understood the book in several ways than just on paper. Now we have changed the task from only read the book and write about it to experience it and also transformed it to a complete new task. Next thing that traditional teacher's hates: when you adopt tech in your teaching, you're also going cross curriculum. The book example above is not only language but STEM (science, technology, engineering and math). So, the good thing is, if you're colleagues are open minded, they don't have to use a game in their classes, but use the magic of it. 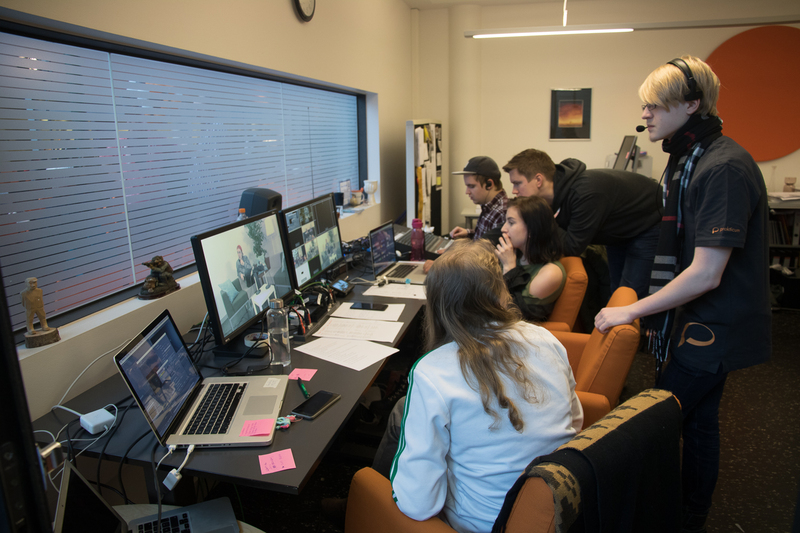 For example, we're now have eSport as a free elective course. The best way to help our students to improve in their hobby is to help them with exercises in the gym (strength and endurance), language teacher have the course as a discussion topic, math teachers can use the topic to probability theory, the four operations, percent and statistics. If you need inspiration what to build, use plain LEGO instructions. Together with my daughter we've built Friends Lego inside Minecraft where she had to reflect over scale, math, problemsolving and be creative. In mid November we did a field trip to TeacherGaming in Tampere together with the Finnish Swedish iLearning tutors. We had the honor to listen to COO Mikael Uusi-Mäkelä who talked about what happened after MinecraftEDU and showed us a very neat tool: TG Analytics! To be able to monitoring your students while they play any game, connected to this analytic platform, would be like a dream come true. It will save so much time when following up students activities! Best of all, when you see what skills they have practice and which ones they have not, you should be able to push out that needed skill to their next log in. That was actually the feature that hooked me. Back home I immediately contacted them and signed up as a beta tester. And please keep this in mind; the platform is not ready! You are a beta tester. Some people might look at it and think it’s the complete product - which it's not - and leave it when they see something broken. When you see something broken you report it, that's why you are a beta tester! 1. The price has to be low. With that said, usually 500€ sound expensive while 350 students which cost 2€/school year suddenly is affordable (even though the price just turned higher). 2. It has to be simple. Teachers - or parents - learning curve has to be low. The tool has to be that simple so you could learn it within 5 minutes. Already to use tech usually stress teachers enough to avoid adopt them, no matter how awesome they might be! 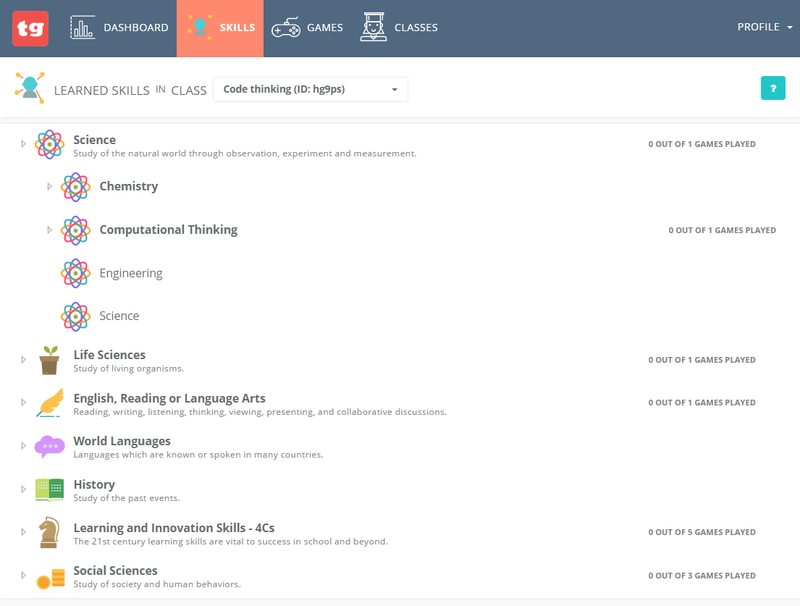 Does TeacherGaming meets my requirements? As they're in beta phase there's no price tag just yet, but what I've understand from my discussions with the dev team it won't be expensive. The tool itself will most probably be free but the games connected to the platform will cost some. I just love how simple, clean and easy it is. Simple right? I name the class, an ID is generated and now my class is up! 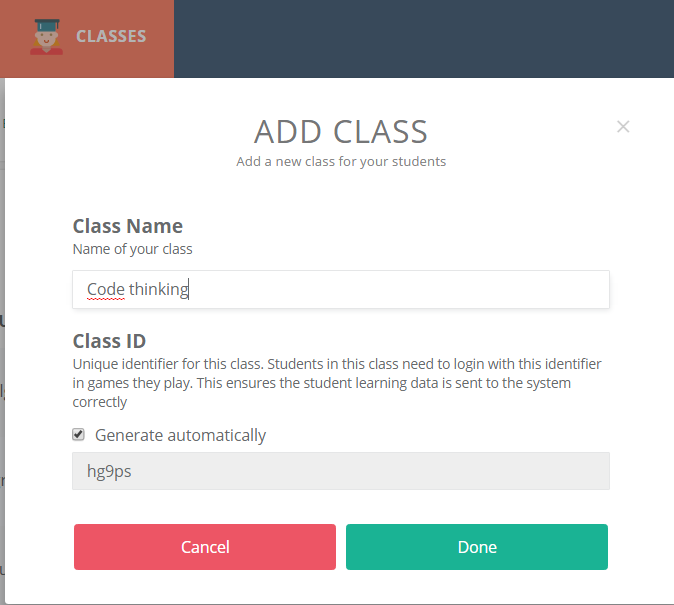 Next, we add a student, it's as easy as create a class. We write the students name, and we also get a student id. The skill tree is another awesome feature. You should be able to pick your "own" curriculumno matter if you're teaching grade 1-3 in US or grade 4-6 in Sweden. The Dashboard, it's where everything happens and you can follow your students (or childrens) progress. But hey? No games added yet? Nope, students havn't logged in so there's nothing to see. But as I started a code thinking course, I'd like my student to play Switch&Glitch. 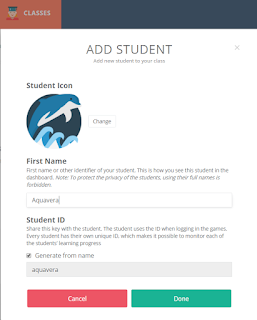 I've installed the game on the device and now my student log in, using the class id and her student id. As soon as she, my student or actually daughter, are logged in to the game, real-time information will start to show up in TG Analytics. How awesome is that? When I click on my student I will get up more information about the skills she's learning while playing the game! Why don't sign up as a beta tester you too? 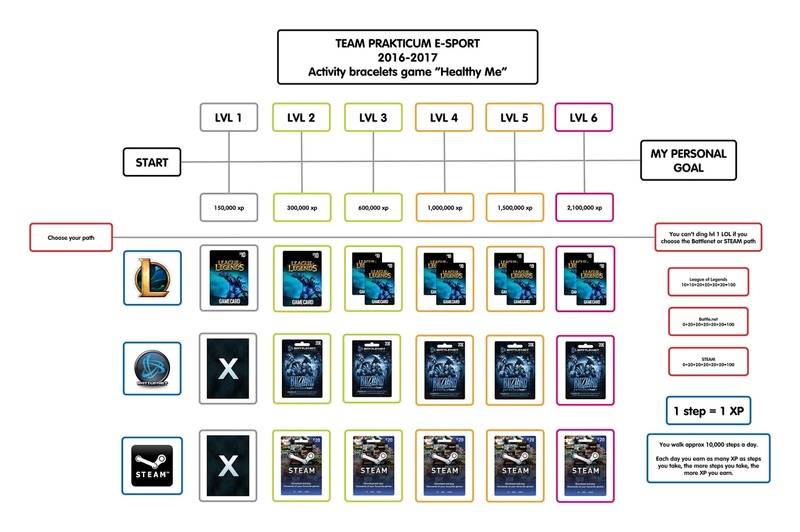 To our eSport course we got funding to improve the health among our participants. During the school year 2015-2016 we tried to use season tickets to the swiming hall but it turned out many of the gamers had such a bad self-perception they didn't had the guts to go there. Therefor, with funding, we wanted to try activity bracelets. Would it be possible to make our students aware of the every day exercise and 8 hours sleep if you use such a bracelet? Serious competitive gaming requires leading a disciplined life. And I end the quote (from slide 25/32) and Jaana's presentation about "Digital games and health" backed up with science can be found from here. It turned out not only the eSport industry thought this could be a good idea but also Insmat.fi who gave us a nice price. Suddenly we could afford a reward system, with other words, use gamification on everyday exercise to make our students aim to walk 10,000 steps a day! The system works as XP in every other game you play, you collect it and when you reach a certain level you ding one level. As the game cards wasn't in any other value than 10€ (LOL) and 20€ (STEAM/Battlenet) the distance is quite far but still realistic. The highest level is 6 and 2.100.000 steps as we'd like our participants to be able to get the rewards before summer. Between January 1st and May 31st it's 151 days, if you aim for 10.000 steps a day you need 150 days to reach 1.500.000 steps and level 5. To reach level 6 you need to walk 14.000 steps a day for the next 150 days and that's really a lot! Also, if you start with LOL you ding the first and second level before you can change path and choose another game card. Strange, this is the outsiders biggest concerns but not the participants. Could it be more tempting to an outsider to fool the system? Ask yourself, what would they win with cheating? Another 20€? Is it really worth the risk of 20€ to be known as a cheater in such a small group (20+15 students) and also make the responsible teacher who fight for you and your interest disapointed? First our students got the activity bracelets and the game was on! It was not only the rewardsystem itself that started to motivate the participants but also the competition; "how far distance have you walked today?" But when they saw the pictures of the bought game cards, they took a deep breath and whispered: "O h m y g o d !" Yes, now it's not only talking but for real! 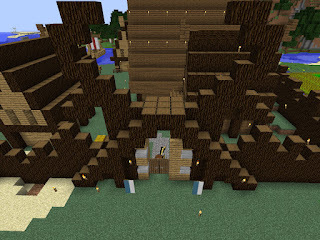 So I have this math course inside Minecraft with a student who learn in a different way. He also fears math so we need this safe environment where to learn. to collect and group information related to their own industry. The challenge is when it says "related to their own industry", luckily it also says "needed in everyday and working life" and that's an easy one. 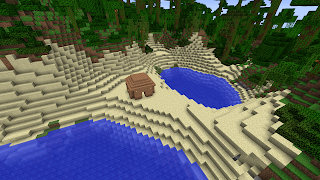 We're aiming for number 3, 4 and 5 as you can do that inside Minecraft and also have lots of discussions outside game how it relates to the everyday and working life math. 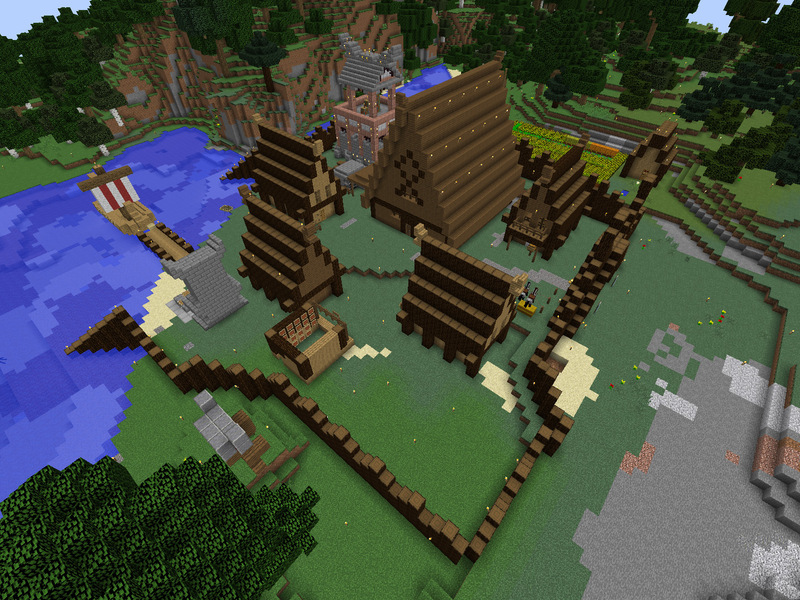 As my student could choose we now build a viking village. First he had to draw sketches, make a game plan, then start with the palisade and townhall. 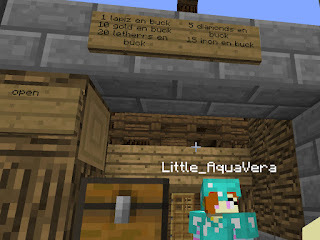 As my daughter - little_aquavera - every now and then joins me the village suddenly got a third tribe member. My daughter 8yo joined with the words "you can't fool me! I will not do any math!" and that might be true, but she needs to practice writing, reading and spelling and that's exactly what she's doing! During the summer semester she learned English just by watching YouTube and now she starts to write it. So here we suddenly have a guy, that doing math all the time with a smile on his face and as the world is vanilla survival he (or we) have to collect all the resources that's needed. We also need food and animals. Suddenly we reached a breaking point and it was my daughter who started it. As she ain't that brave what comes to mobs she had started to think about what she could contribute to this village and came up with a book shop. She's now the poet of the Viking village. She also started to put pricetags on her work. 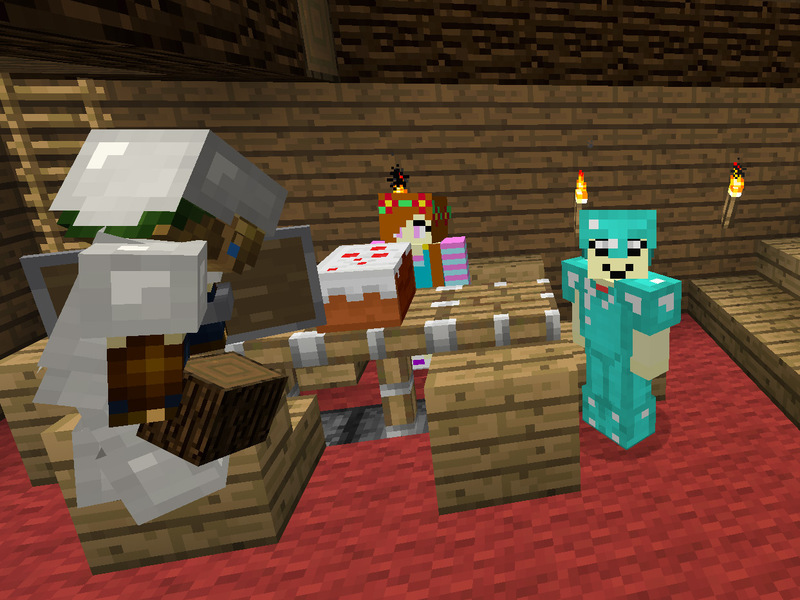 It was time to gather the village councils. At the first council, in game, we agreed on what currency we should create and how to use it. 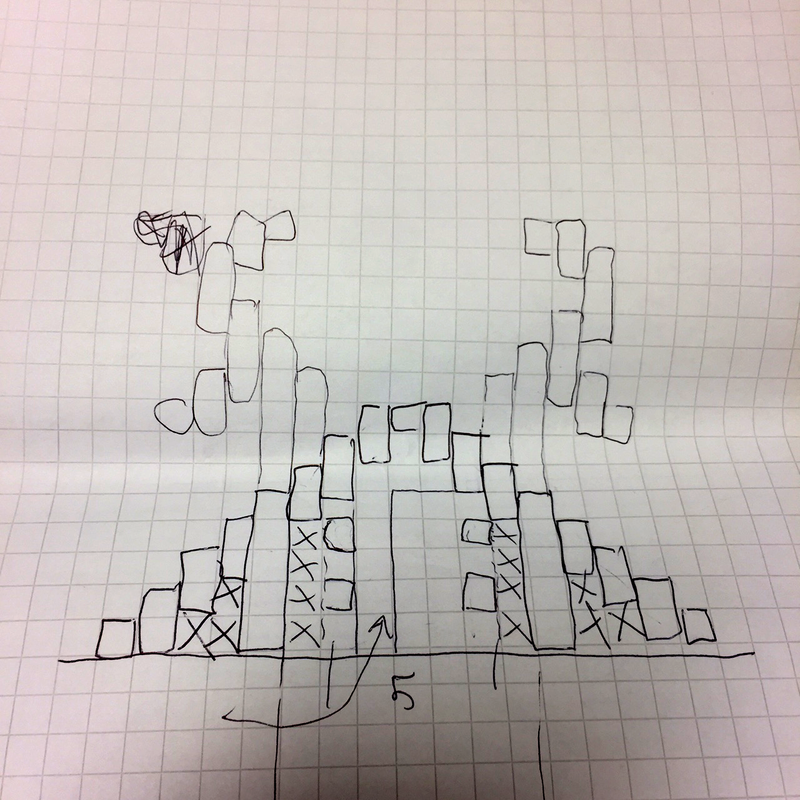 At the second meeting, in the classroom, my student had to come up with an idea what everyone's work would be worth. Also, if some profession needed something extra as armor, weapons or tools. At the third council, now together with my daughter and in the classroom, he had to start think about taxes. And suddenly this was so fun so even the little poet was doing math, mental arithmetic and put notes. They both agreed on planning and monitoring is vital and important. That includes also democracy (civics) and active citizenship (key competence for lifelong learning). Both also agreed it's in the realization phase they're learning. For example; the soldier got paid with 20 lapis lazuli and 20 gold ingots. The tax is 1/5 (20%) and he have to give me (the Jarl of the village) that amount. Also, when he collects animals, he have to give me (the leader 1/5). With the evaluation, we're connecting today's lesson and connect it to the everyday and working life. And suddenly he understands.